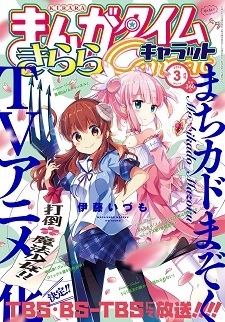 The March 2019 issue of Manga Time Kirara Carat announced a TV anime adaptation of Izumi Ito's comedy slice of life manga Machikado Mazoku (Street Corner Demon) on Monday. The anime series will air on TBS and BS-TBS networks. Awakening her dormant abilities as a devil one day, Yuuko Yoshida aka Shadow Mistress Yuuko, is entrusted with the mission to defeat the Light clan's shrine maiden, a magical girl, by her ancestor Lilith. Yuuko meets magical girl Momo Chiyoda through her classmate Anri Sada, and challenges her to a duel, but loses quickly due to her lack of strength. Since then, Yuuko has struggled with her role as a devil and her duel with Momo, and borrowed help from her regularly. However, by a strange coincidence, Yuuko also weakens Momo by taking away her power to cooperate in protecting the peace of Tama city. The 4-koma manga ran in Manga Time Kirara Carat as a guest series in the August and September 2014 issues before beginning regular serialization in the November issue of that year. Houbunsha published the fourth compiled volume in October 2018. Yes! More Kirara is always welcome! I need my dose of cuteness in my life. More kirara more yuri much fun! More Kirara is always welcome. A cute comedy show. I'll be looking forward to it! This looks like a potential interesting comedy. I'll be looking forward to it. More Kirara is always welcome, looking forward to more new about it! I never say no to anything coming from manga time Kirara or the other magazines from Kirara. I've heard of this manga before but never read it. The premise lends itself to a quick laugh and I want to try it out. I never say no to a SoL. That synopsis sounds rather interesting too.